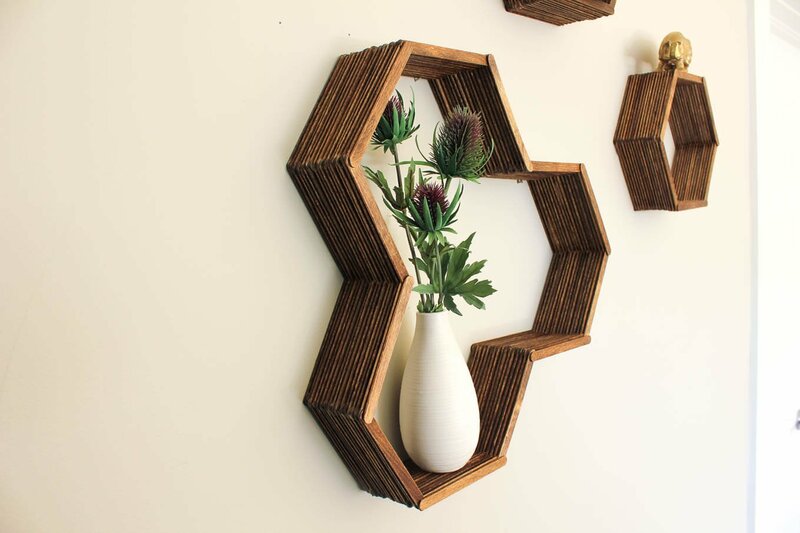 UPDATE: After you make this shelf, check out Part II to make an expanded set of DIY honeycomb shelves that would make Don Draper drool. Guys. I am so excited to share this tutorial. And if you’re reading this, I’m assuming you like to make stuff too, because, well, that’s what we do here. So I’m guessing that you can relate to having an idea for a project and how it can get tangled in your brain like a Bruno Mars song, refusing to dislodge until you just make the darn thing. 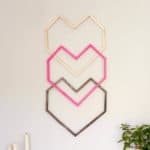 That’s what happened with this DIY wall art idea. It came to me one night when I was pacing back and forth in our bedroom in the dark. (Comforting baby Quinn, of course. I don’t do that otherwise. At least not often.) I was thinking about additional three dimensional art pieces I could DIY for our bedroom gallery wall. 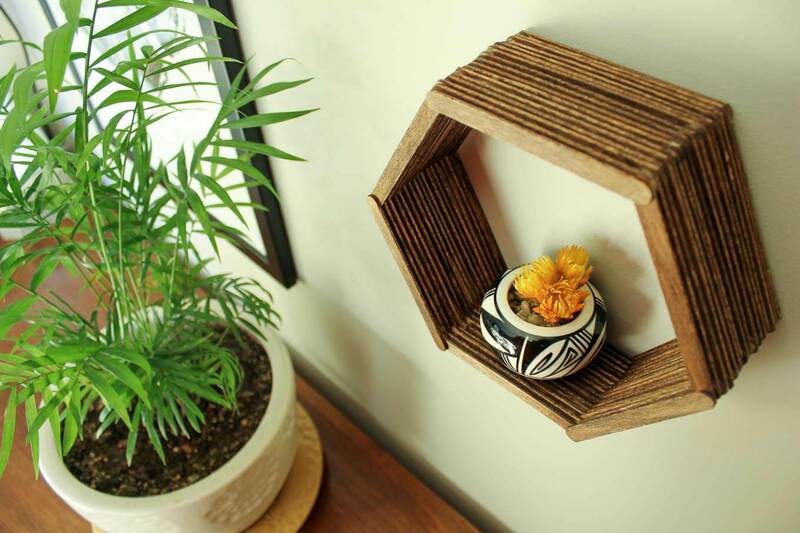 I wanted something that would add texture, warmth and angles, but unfortunately, most DIY geometric display shelf tutorials I’ve seen are waaay complicated. After experimenting a bit, I realized that having a template to guide my shelf angles would be super helpful. So I put one together and added it to the Make & Do Crew Vault. If you’d like the template, simply enter your email in the pink and green box at the bottom of this post and you’ll gain immediate access to it and all our past and future free patterns and printables. This post contains affiliate links for your crafting convenience, at no extra cost to you. Thanks for supporting Make & Do Crew! 1. 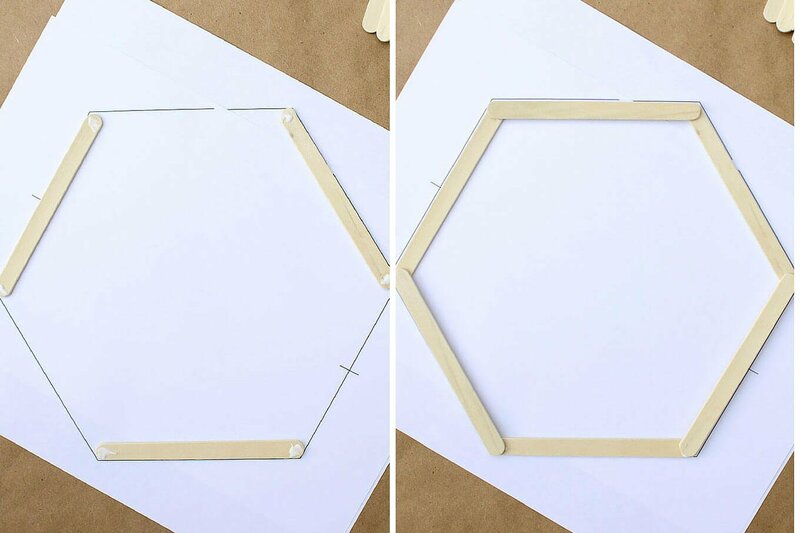 Add a drop of glue to both ends of three popsicle sticks and lay them as shown. 2. Layer three more sticks to complete the hexagon. 3. 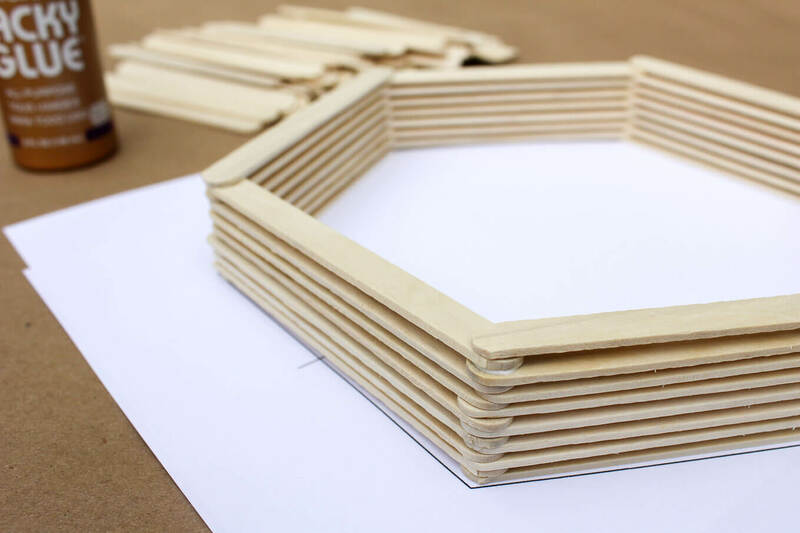 Continue glueing and layering like this until your hexagon shelf is a deep as you’d like it to be. Mine is about 16 sticks deep. 4. Allow the glue to dry. Do your best to keep your three-year-old from using your in-progress shelf as a wooden Bumbo seat for her dolls. 6. 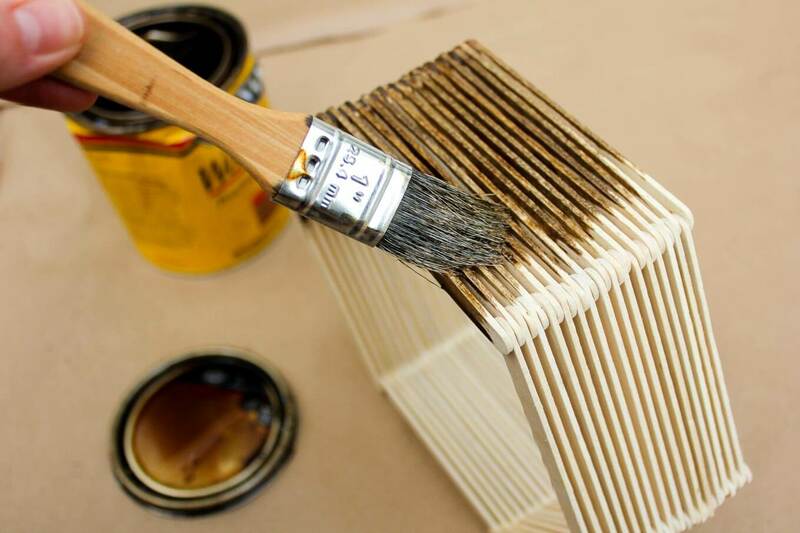 Stain your hex shelf, taking care to get stain in between all of the popsicle sticks. 7. 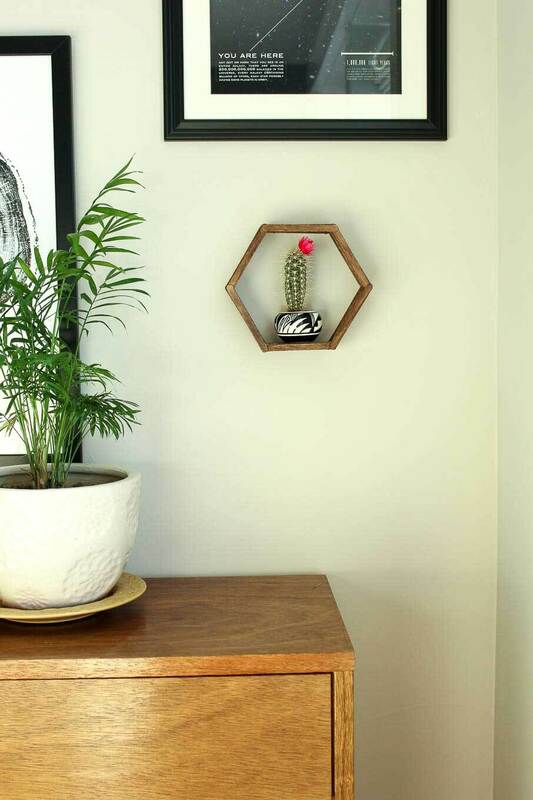 If you’d like, glue a picture hanger to your shelf. I skipped this step because I opted to just put two nails in the wall that the shelf could hang on. Can’t get access to the hexagon template and would love to keep following your sight! It just links to a pic of the finished product. Thanks again for helping be my tech troubleshooter! I cannot access he hexagon template. When I use the link that was sent to my email address, I get redirected to this site and it ask me for my password which I put in but it just keeps reloading and asking me for my password again. The password is in the email you received with the link. It’s the same for everyone and case and space sensitive. Please provide me with the password. I subscribed before, but the email is no where to be found. I tried again, but did not receive any Email. Sorry I can’t find any mail, not even in the spam folder. Did you get what you needed? If not, please send me an email and I’ll make sure you get the template! Dear Jess, sorry I didn’t get anything. Looking forward to the Email. I never received anything from your side and I like to get started on my projects. I am also unable to link to the template. I click on the box “Name” and it takes me to a picture of the finished product. Thanks so much for clearing that up. I see what you mean and I’ve fixed it. What a goofy little tech glitch. I’ve sent you the template as well, but please feel free to subscribe if you’d like access to the rest of the free resources vault. So sorry about the trouble! This is spectacular, so easy to make definitely easier than what I have come accross! Oh, thanks so much, Marwa. I made another one last night and it really IS so easy! Happy New Year! Make sure the first letters of both words are capitalized with no space between. Sometimes an extra space can get included afterwards when you copy and paste, so you might want to watch for that too! Super cute! I love your ‘reality check’ 🙂 cacti can be such prickly lil suckers! The final result is adorable, I’m considering making one for my gallery wall. Thank you for sharing! 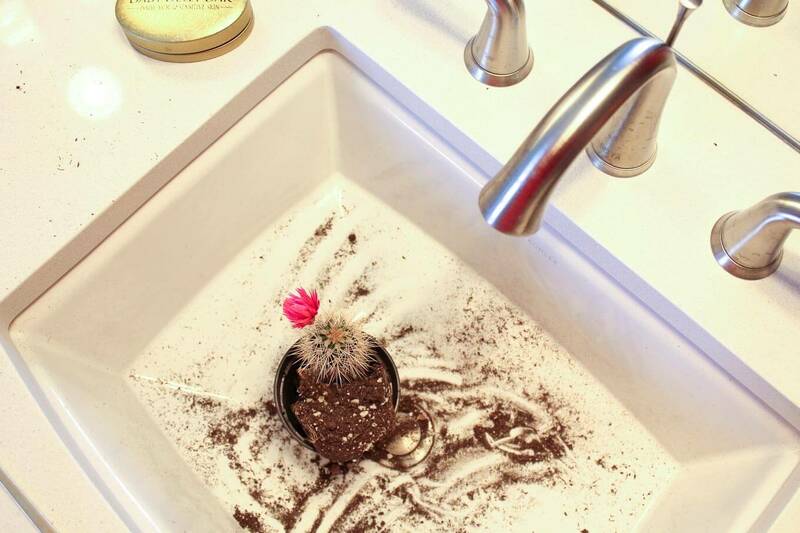 Yes, those darn cacti! I always underestimate them 🙂 Thanks so much for your kind works and for reading Make & Do Crew. 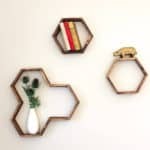 I’d love to see your hexagon shelf if you make it! i love that this isn’t just made with wood, which would still be cool. 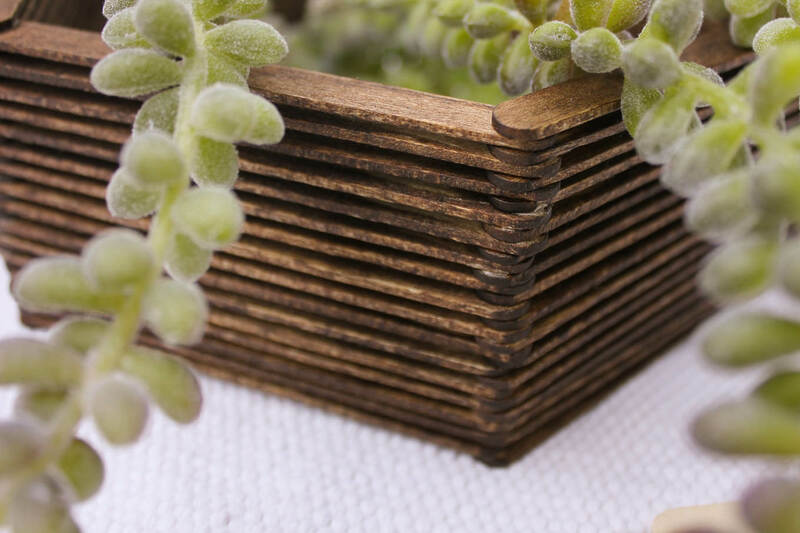 but this is even more diy than that, and pretty much the fanciest looking thing made with popsicle sticks. awesome. Jess, this is really cool! Love your projects! Thanks for sharing with us at Brag About It. Pinning to share and look for your feature next week! Happy New Year! As always, thanks for visiting M&DC. Like honey comb look would like to have template. Thanks for reading M&DC. To receive access to the template, simply subscribe by entering your email address at the bottom of this post (in the box right above here). You’ll receive a confirmation email (check your spam or promotions folder). Click the link in that email to confirm that you indeed meant to sign up. After that, you’ll immediately receive an email with the link and password to download the template. Seems like a lot, but it’s pretty easy. Let me know if you have any other questions. I’m happy to help you. I love this project!!! I think it is so creative. Thanks for sharing. 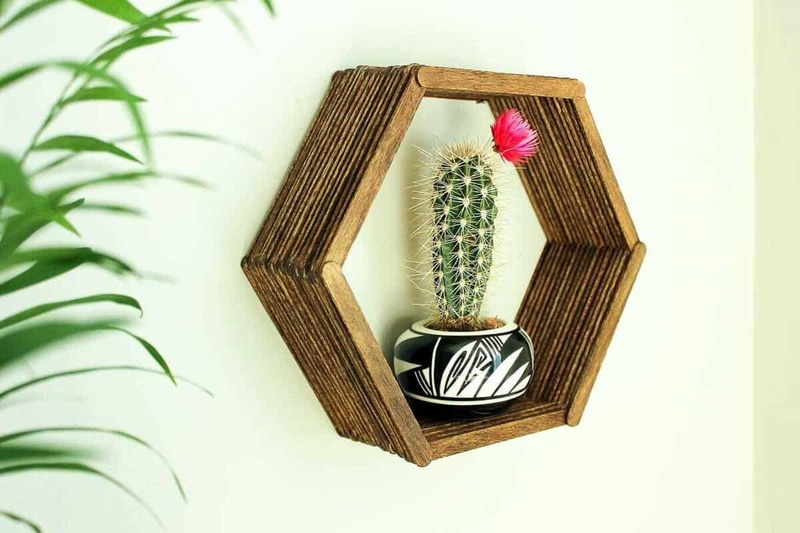 I’ve wanting to buy or make a shelf in this shape but didn’t want to spend the money or bug my hubby to help me figure it out. This one seems so simple! Brilliant. Thanks so much, Chelsea! I’m all for independent non-husband-engaging crafting. I suppose it’s the feminist in me 😉 Just kidding, I totally know what you mean though. Some of the other tutorials I’ve seen have SO MUCH MATH. For better or worse, you don’t have to be very smart to make this one. Ha. Thanks, Jim! I really hope it is. I sure enjoyed making it. Let me know if you have any questions as you’re whipping yours up. Just wondering, is it any easier to stain the popsicle sticks before putting together and gluing? That’s a good question about staining the sticks. I think you should always do a project however makes the most sense to your brain. There’s usually more than one right way. I think staining after you assemble the shelf might be a little quicker (it really didn’t take long! ), but staining beforehand might ensure all your sticks are perfectly, evenly stained. Let me know what you decide to do. I’d love to know! Thanks! I think we’d all rather appear perfect, but it’s important to tell the messy side of the story too! cant get access really love this craft and would love the template but cant gain access to it, i have subscribed an still wont work. Let me know if this works for you. I’m happy to help if not. Let me know if this works for you. I’m happy to help you further if not. I’m sorry you’re having trouble! I don’t want anything to stand in the way of your crafting, especially when you’re eager to get started! Let me know if this works for you. We’ll get you going, don’t worry! Thank you so much for this AMAZING project!! I’m so excited to find this tutorial! Your boxes are amazing and I can’t wait to make my own. Just one thing – I subscribed to the blog and now it is asking me for a password to access the template. Anyway you could send it to me? Thanks so much! Thanks so much! I think you’ll love to make them, too. Do you know how long it usually takes to receive the email after subscribing? I’m not getting anything but I want to make sure I’m not just be impatient! 🙂 Thank you!! I am too, Jamie! That intersection of affordable, stylish and well-made is pretty much my happy place. Hope you enjoy your new place! Thanks, Linda! Apparently there’s no end to the shapes you can make with popsicle sticks because I’ve been dreaming up different patterns left and right–it’s so fun! It’s hard to tell, but did you use the jumbo Popsicle sticks instead of the regular size? I just subscribed and plan on making this tonight after work. 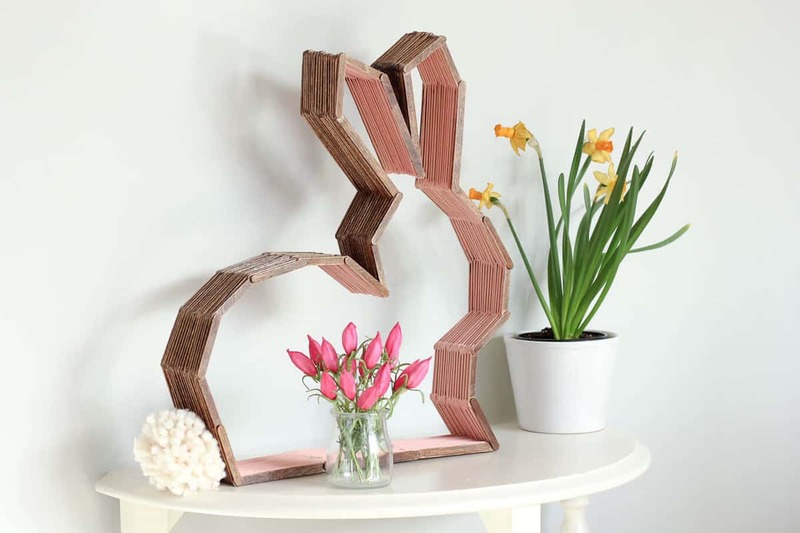 I love my hot glue gun and am wondering if you tried using that for a popsicle stick project like this one? If not, I will pick up some tacky glue. Thanks! 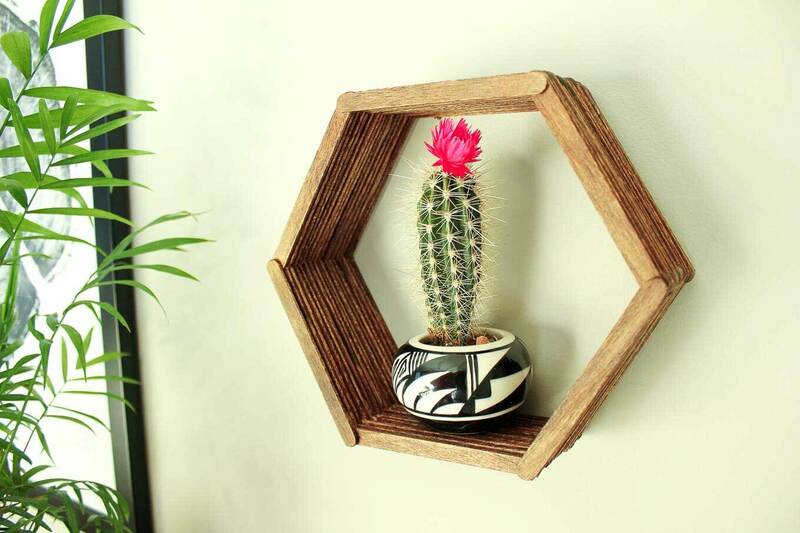 Hi, I was wondering where I can get the template for this shelf. If you enter your email address in the white, green and pink box right above these comments (or the one on the right side of your screen), you will immediatly get an email with the download instructions. Let me know if you have any other questions. I’m here to help! I love hexagons and honeycomb patterns! I’ve been meaning to spruce up my ‘office space’ in my bedroom a little and this tutorial is perfect for it — at least once I figure out how to get nails into the wall 😉 I’m more of a paper crafts person but I’m definitely going to try this out! Lyssy, you can add some scrapbook or wallpaper to the back of your hex shelf if it would feel more your crafting speed. 😉 Really though, this is a surprisingly easy DIY to tackle, especially with the template. I hope you enjoy it and it inspired lots of great work in your bedroom office! That’s a fabulous idea! I just bought two different sizes of popsicle sticks today and I think I’m going to build them in different depths — some as frames for my lettering and others as a shelf! All spray painted white. Going to do this tomorrow and I can’t wait! I really need to try this Project, just and answer, doesn’t be easier to first Paint the sticks and then glue it?? thnks a lot. You can definitely stain the sticks first if you want to, but I think that gluing them first and staining them second is a little bit faster and easier. Let me know what you end up doing. I’d love to hear how it works out for you. Yay, Victoria! I’d love to see it when you’re finished if you’d like to tag me on Instagram (@makeanddocrew). I hope you enjoy shelf building! Hi! I saw this idea from a youtube channel called “Whats Up Moms” and I thought this idea was soo cool!!!! I tried to get the template(I already subscribed) but the sign in page would just keep popping up. Can you please send the template to me? Thank you! Hi, I’ve Been trying to have access to the hexagonal template … I gave my email but I didn’t received nothing and I checked my junk mail too… It’s getting really frustrated. I’m sorry you’re having a hard time! It sounds frustrating. Would you like to enter your email address again and I can check on the backend to make sure it goes through? That might help us troubleshoot. Perhaps there was some internet elf that stole it the first time. Let me know when you try again and if it works and I’ll make sure we get you the template either way. (You can email me too at makeanddocrew (at) gmail (dot) com. I’ve tríed 2 more time … Thanks anyways …? Hello. I subscribed twice to get the password for the templates and I haven’t received anything yet. Have you checked your spam or junk folders? It might have gone there. It’ll be sent from makeanddocrew, so you might want to search for that to see if it turns up. If not, let me know and I’ll help you troubleshoot further! Hi, I saw this idea on Pinterest and I love it! I think I’m going to make it with paper sticks instead of popsicle sticks and then share it on my blog. Don’t worry, you and your pattern will be properly credited 🙂 Thank you for sharing!! Awesome! I’d love to see the photos when you finish, Ivona. How do you unsubscribe?? Gave wrong email ??? You will receive an email from me and there will be a link to unsubscribe at the bottom of it. If you can’t access that email account for some reason, you can give me the email address you entered and I can manually remove you as well. Such a great idea, I can’t wait to try it!! Yay, Sophia! Hope you enjoy it! They’re so easy and fun to make. Hello, I would love to make this for my daughter upcoming big girl room. where do i get the Honeycomb template please? Thank you!! Hello Jess, Thank you for reply back. I just went and subscribed, i haven’t got any email but i went to click on the template and its asking for password. Thank you. The PW is in the email you should have received. Did you check your junk/spam by any chance? I’ll email you the PW now myself just to make sure you have it. Has the template always been protected by a password? I printed one off like a month ago and didn’t have to subscribe or use a password. I accidentally threw it away before making my second one..
Hi, I am struggling to download the hexagon template, it is asking for a password to access it and I have never created one? Would it be possible for you to email me it? Love this thing! easy to do! You don’t need the template, but it helps quite a bit with getting the angles just right and making your shelf look more tidy. I am planning on working on this shelf this weekend! Have you tried E6000 or hot glue or is Tacky Glue really the best? Also – have you ever tried gluing a picture hanger on the back of one? I wonder how sturdy that would be. I realize this might be too late because you might have already made this, but here’s why I prefer tacky glue–hot glue creates so many glue cobwebs that I don’t think the overall look is as clean. E6000 is great, but I find it messier (and stinkier!) to work with. Tacky glue can easily be wiped off if you use too much and the shelf is actually incredibly strong by the time you’ve glued all the sticks together. I think a picture hanger on the back would be great! If you did try a diff glue, I’d love to hear how it worked. Hi, just stumbled across your gem of a website! And I’m in love and also wondering if you think using a glue gun would be okay? Welcome! The thing with a glue gun is that you’ll have a lot more “spiderwebs” to contend with. This shelf uses so many small dots of glue that I think it could get a little messy. That said, I have used regular Elmer’s school glue and it’s worked fine as an alternative to tacky glue. I;m about to make the shelf, just need the template to get started this evening. Thank you. If you’ve subscribed, you should have an email waiting for you with the download instructions. If you don’t see it, search your spam and junk folders for “Make and Do Crew.” Sometimes it can get stuck in there. I find this idea just great and would like to create such elements for my apartment. Could I please get a password, so I can download the template? I would send you pictures of my results if you wanted. Hello from the US, Katrin! If you subscribe in the box above this comment area, you’ll receive an email with the download instructions for the free template. I’d love to see a pic of what you make! Can’t wait to start! But will any kind of glue do? I’m afraid that the glue that I have won’t be strong enough and will make it unable to place something as heavy as a vase in the hexagon. Surprisingly, even Elmer’s glue makes a pretty strong bond. I think it’s because there is glue on so many separate surface areas within the shelf. OMG! 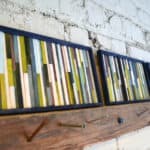 An accessible diy project to add to my midcentury modern decor!!! Thanks so much! I always look for those qualities in DIY projects too! The shelf is actually really stable. I think it’s because there are so many touch points with glue on them. The limiting factor with the weight is more likely just what you use to hang it in the wall. I have a brass rhino sitting in the shelf now that is far heavier than the little succulent and I’ve had no problems. I hope you enjoy! Great ideas! Very nice diy art. thanks for sharing…………. Could I get the template for the popsicle shelf project? You should receive an email from me right after you subscribe that has the PW in it. If you haven’t seen it, perhaps check your spam folder or search your email for “Make and Do Crew.” Hope that helps! Hello! A bit late to the party here but would it be possible to get a template for a larger hexagon? Something more like 10-12 inches? Love this idea and want to get started asap, but I haven’t received your email yet with the template. Could you send it to me? I LOVE that idea! They really are pretty easy (and affordable!) once you get in the swing of gluing and placing sticks. I just finished my shelves and theyre awesome! Thanks for the template and instructions! I was just wondering what you used to hang yours? Do you have a link to where the black and white vase that the succulent is in is from? I love it! 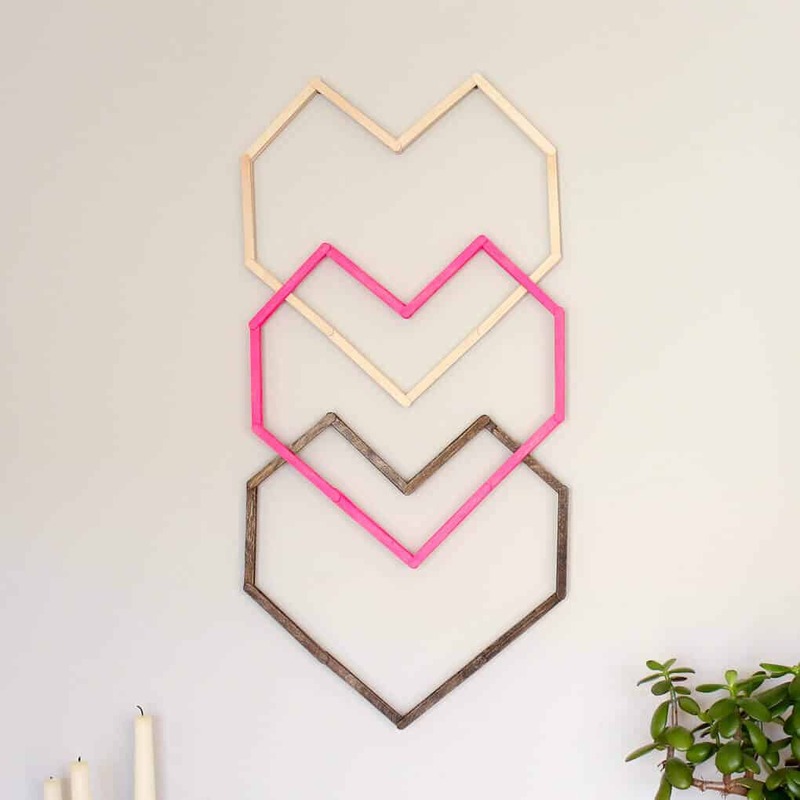 Hi Jess, I love the Popsicle Stick Hexagon Shelf. I have downloaded the templates. My question is about the size of the popsicle sticks. Did you use the 3″ Sticks? Could the jumbo size sticks be used? Thank you. I used the “regular” sized popsicle sticks. I reference the size in the supplies section of this tutorial, but I think they’re around 4.25″ or so. You can def use the jumbo sticks, just build them around the outside of the template. I’ve seen people do it this way and they turn out great! Jess, Hi. Just found your blog and love this “shelf” idea. By any chance do you know how much the finished project weighs? I live in what is called a “manufactured” home (trailer). The walls are not hanging friendly. I am thinking that changing colors to match the room would be another option.